When it comes to surveillance systems, it is imperative that you have a reliable security camera installed around your property. They allow you to monitor any activities or events that transpire on your property when you are away. In the event of trespassing, vandalism, theft or various other crimes, you will be able to use your security camera footage as evidence in a court of law. Everything from banks, schools, hotels, residential homes and business establishments are installing security systems on their property to help provide a means of security for all of their belongings. For those who are thinking about installing a surveillance system around their home, plenty of options are available on the market from which you can choose. Each one of those cameras will each come with their own set of advantages and disadvantages for installation. An infrared security camera, or night vision camera, is capable of working during dark and well-lit lighting conditions. When it comes to a lit area, the infrared cameras will provide you with a color picture, while nighttime scenes are portrayed in black and white imagery. The main component of an infrared camera is their capabilities to help detect any infrared radiation, which includes that of body heat. It allows the camera to help use their capabilities for viewing nighttime images. Just as the name implies for this type of camera, it is shaped similar to that of a dome. Since these are higher end cameras, they are generally positioned on the ceiling of your home or business. A dome camera is generally black. Most of the time, you will find these cameras in airports, banks, casinos and office buildings. One of the advantages to this particular type of camera is its dome that ends up covering the lens of the camera, which makes it difficult to determine the direction in which the camera is pointed. 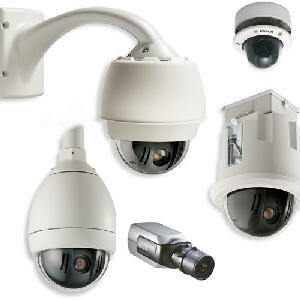 IP cameras are security cameras that are based upon the Internet. You can view, record and manipulate these cameras from any number of locations throughout the world. Thanks to its built-in Internet server, you will be able to connect the camera to a network. It has its own Internet address that allows it to communicate and function over the Internet. Remote viewing cameras can come in multiple types of recorders, which can range from a dome camera to closed circuit television cameras. If you are after something that is portable, mobile, versatile and easy to disguise, a wireless security camera could be the perfect solution for all of your needs. Most of the time, these cameras are referred to as spy cameras. You have the capability of disguising these cameras in just about anything you desire. Some of these cameras are small enough that you can fit them into your jacket button. Instead of using a bunch of wires, it is capable of using a transmitter that will operate on batteries to help broadcast your images onto a localized receiver. Outside home security systems help to protect your home from any potential burglary, damage or vandalism. Using an outdoor surveillance system will help to provide your family with the peace of mind you desire, while delivering an extra layer of protection for your most prized possessions. Since there is an abundance of surveillance systems on the market today, you can look through some of the guidelines to help determine what system is going to work best for your home. it is also important to choose the proper placement for your security system, as well as how to monitor your system to help deter any potential threats from coming into contact with your home. You want to select an outdoor device that provides your home with the security it needs. Make sure to look through the various factors for your home depending on the size of your home, landscape layout and location. Even though a wired security system is a cheaper alternative to their wireless counterparts, a wired system may not be as effective when you are not able to hide all of the wires around the exterior of your home. Since you won’t have any wires that need to be concealed, a wireless system will help provide you with the quality video images you need right to your computer, digital recording device, Internet or other form of storage device. A wireless security camera needs to be in an area that is easily accessible, so that way you can monitor your battery life. A domed security system is perfect for monitoring your doors ad entrances into the home thanks to their wide view. If you have a concern with lighting conditions, an infrared bullet camera is the best option for capturing images throughout the evening hours or a dimly lit space. Most homes today will need at least four cameras on the outside of their home to ensure every angle is properly covered. It is imperative that you cover your backyard, front doors, driveway and back doors. An outdoor security camera is one that needs proper installation on areas that can’t be accessed from criminals. When you decide where you want to install your new home security camera, you will want to look for a place on the exterior of your home, such as on the underneath of an overhang. Make sure to look for any areas that are discreet on the exterior of your home. Places where there is an extensive amount of shrubbery or decoration on the exterior of your home can make it difficult for the cameras to be detected. It is imperative that you choose the perfect location for your home security system. Go through all of the options and determine what is going to work best for your particular needs and lifestyle. Contact us today for a free consultation, our pros will be happy to assist you.